[I]t really is remarkable that for all the bellyaching about the decline of bipartisan behavior in DC there's very little attention paid to the fact that there are actual reasons this has happened beyond Newt Gingrich being a meany and bloggers being too shrill. The Jim Crow South gave rise to an odd structure of American political institutions whereby both of the parties contained substantial ideological diversity. This had the benefit of setting the stage for a wide array of cross-cutting alliances. It came, however, at the cost of consigning a substantial portion of the population to life under a brutal system of apartheid ruthlessly upheld through systematic violence. After that system collapsed, there was a two decade or so period during which the voters and parties were re-aligning themselves during which we had cross-cutting alliances but no apartheid. And now the aligning process is done, so we have two parties where essentially all Democrats are to the left of essentially all Republicans and so you have relatively few genuinely bipartisan coalitions. 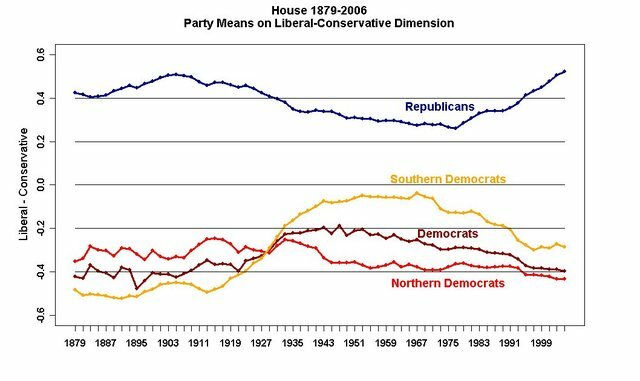 In short, the rise in bipartisanship was driven by Southern Democrats. Now that they are an endangered species, we've returned to the historical norm of sharp partisan conflict. 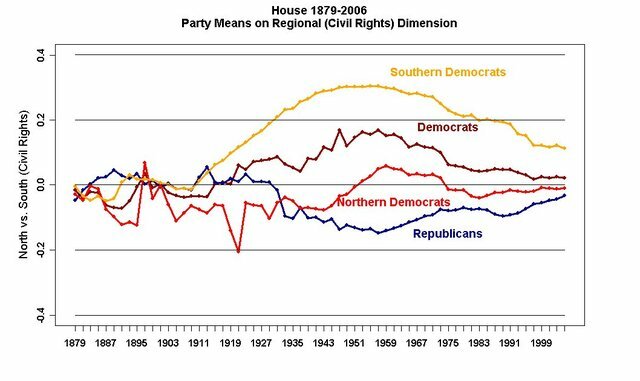 it looks like this shift in the Southern Democrats' alignment started to change just after 1912 or so - can you put that in perspective? What happened around that time that would cause this change? Direct election of the senate meant that senators had to be more responsive to the people. Elite "liberal" southern senators were replaced by populist Jim Crow southern senators. Of course, my theory doesn't explain the House. Hmmm, the explanation must be women's suffrage! Yeah, that's it! I'm not sure; you'd have to consult some histories of Southern politics, presumably. It might just be the beginning of the long, slow rise in salience of the issue of race and region in national politics. 1. (northern) progressives turned off by Taft began shifting to the democratic party. 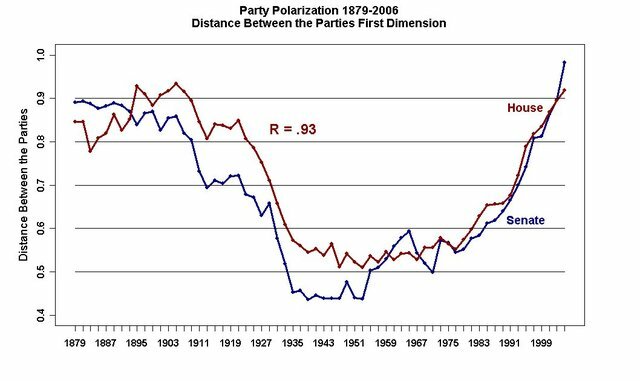 2. the end of the czar speaker era led to more center coalitions in congress, allowing progressives from both parties to vote in similar fashions on some issues.